Be different and stand out. Metallic ink brings life to every color on your business card with its distinguishable luster. Bring a handful of metallic print business cards to conventions, meetings, trade shows, or networking events. You won’t be forgotten. Metallic business cards are printed on thick 16 pt. cardstock. This particular paper is not easily bent and will last a long time. It’s one of our most premium paper offerings. Spot UV adds an extra kick to your custom metallic business cards. It takes a logo or text and makes them more prominent. 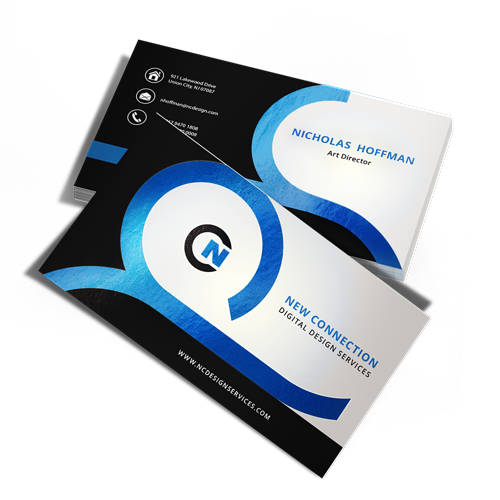 Visually, your business cards will give off the appearance of multiple textures on the printed surface. Metallic finish business cards are available in 2” x 3.5” which is the ideal business card size. However, we have other size options for those who’d like to explore outside the box. 1.5” x 3.5” gives your cards a slimmer profile for a sleek look. 2” x 4” leaves you some wiggle room to insert more information. We also have square business cards at 2” x 2” and 2.5” x 2.5”. Ready to get started? Upload your design or use our online design tool to create one from scratch for free. Are foil stamping and metallic ink printing the same thing? No, they’re not. Although they do have a similar effect. Unlike in foil stamping where you only get to use limited colors, you’re able to use most colors in metallic business card printing. What do you mean by turnaround time? Turnaround time refers to the number of days it will take for your metallic business cards to be printed. Shipping time is not included. The turnaround time for metallic business cards is 5 business days (does not include holidays and weekends). Can I apply metallic ink on one side only? Yes. You can use metallic ink on both sides or choose between the front and the back.